Baby Shower Food Ideas - Perfectly Delicious! 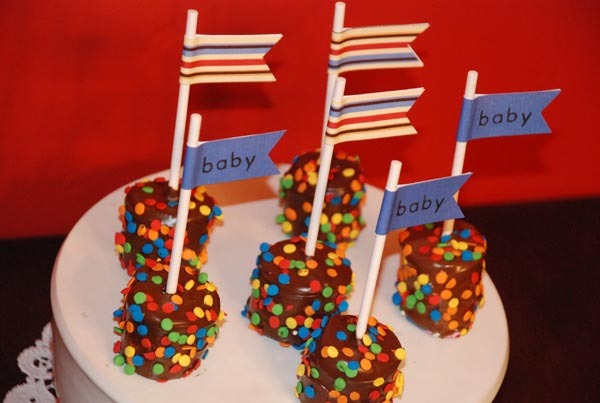 Below you will find some of the most delicious and popular dessert baby shower food ideas and recipes. It is pretty much a given that desserts are the most anticipated and enjoyable part of a baby shower, so let's get right to it! Pour milk into large bowl. Add pudding mixes. Beat with wire whisk 1 minute. Gently stir in 2 cups of whipped topping. Arrange ½ of the cake cubes in 3 ½ -quart serving bowl. Drizzle with ½ of the orange juice. Spoon ½ of the pudding mixture over cake cubes. Top with strawberries. Layer with remaining cake cubes, orange juice, and pudding mixture. Refrigerate until ready to serve (about 1 hour). Top with remaining whipped topping and garnish as desired. Makes 12 servings. Arrange 1/3 of the crackers on bottom of 13x9-inch baking pan, breaking crackers to fit, if necessary. Pour milk into large bowl. Add pudding mixes. Beat with wire whisk 2 minutes. Gently stir in whipped topping. Spread ½ of the pudding mixture over crackers. 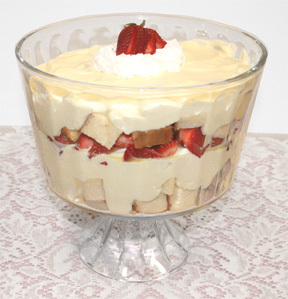 Place ½ of the remaining crackers over pudding; top with remaining pudding mixture and crackers. Remove top and foil from frosting container. Microwave frosting in container on high for 1 minute or until pourable. Spread evenly over crackers. Refrigerate 4 hours or overnight. Cut into squares to serve. Garnish with strawberries. Makes 18 servings. Arrange marshmallows on tray and freeze for 15 minutes. Microwave chocolate chips in glass bowl on high for 1 minute. Stir; microwave for 1 minute. Stir and microwave a further 30 seconds or until smooth. Gently insert lollipop sticks into one end of marshmallows. Using a spatula, coat marshmallows with melted chocolate. Using a skewer or fondue fork, dip marshmallow into melted chocolate until marshmallow is chocolate-coated. 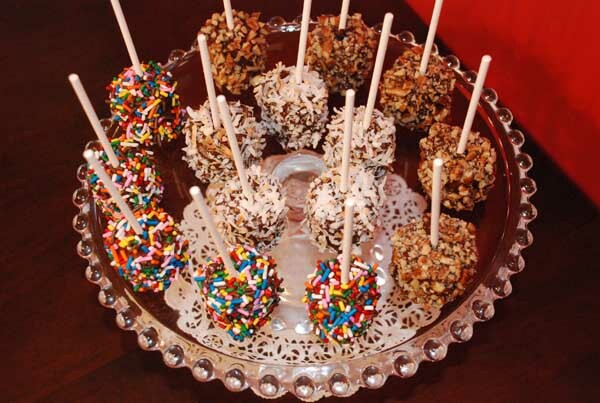 Roll in / sprinkle chocolate-coated marshmallows with coconut, chopped nuts, or sprinkles. Place onto wax paper-lined tray. Chill or keep in a cool dry place. Makes about 3 dozen. Mix first three ingredients together and pour into a jelly roll pan lined with wax paper. Bake at 350 degrees for about 15 minutes. Gently turn cake out of pan and onto a kitchen towel sprinkled with powdered sugar. Roll the cake up into the towel to cool (this will help it keep its rolled shape). After the cake is cool, unroll it and spread a somewhat thin layer of softened ice cream evenly over the cake. Roll up the cake again and wrap it in plastic wrap and re-freeze (before freezing, you can frost the cake or put whipped topping on the cake if desired). 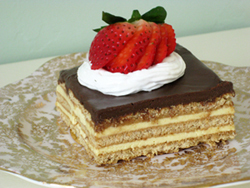 Once frozen, cut the cake into slices and adorn the slices with chocolate drizzle, powdered sugar, whipped topping, etc. Mix cream cheese, eggs, sugar and vanilla in bowl. Beat well and set aside. Place cupcake liners in muffin tin and place a vanilla wafer in the bottom of each liner. Pour approximately ¼ c. cheesecake mixture into liners (about 2/3 full). Bake at 350 degrees for 12 minutes. Allow to cool completely. Peel off papers. Top with favorite pie filling. Refrigerate until served. Mix crackers, sugar and margarine together. Reserve some crumbs for the top, if desired. In a separate bowl, mix lemonade, condensed milk, and whipped topping together. Pour over crumb crust. Top with reserved crumbs, if desired. Mix together and press into bottom of 9x13 pan. Bake at 400 degrees for 7 minutes. Cool completely. Beat together cream cheese and sugar, then fold in whipped topping. Spread on top of cooled pretzel crust. Dissolve jello in hot water, then add frozen raspberries and crushed pineapple. Let set in fridge until syrupy, but not completely set. Spread over cream cheese mixture and let jello salad set in fridge before serving. Heat oven to 350 degrees. Grease 13x9-inch baking pan. In mixer bowl, beat flour, sugar, melted butter, cocoa, 2 eggs, milk, 2 teaspoons vanilla and baking powder until well blended. Spread into pan. In small mixer bowl, beat cream cheese, 2 tablespoons butter and cornstarch until fluffy. Gradually add sweetened condensed milk, then remaining 1 egg and 1 teaspoon vanilla, beating until smooth. Pour over brownie batter. Bake 35 to 40 minutes or until top is lightly browned. Cool; refrigerate. Cut into bars. Store covered in refrigerator. Makes 24 to 36 bars. Note: To decorate the brownies, drizzle melted chocolate across the top and let cool before cutting.